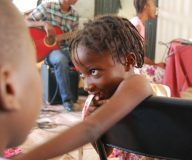 As others have already stated it is almost impossible to sum up your feelings regarding the Hope to Haiti experience. I have been lucky enough to be a part of all three trips and today that journey reached somewhat of a conclusion. I say somewhat because I’m already considering ways to return, my investment in the country and the four projects being such that I can’t imagine that this could be it. The final day is always a strange mix of emotions as a group of fairly exhausted volunteers try to adjust to the idea of returning to everyday life. There were tears and laughs and lots of reminiscing about memories that somehow felt months ago despite it only being a few day; evidence of just how much we managed to do. Currently I am sitting in a room in Miami with 8 other volunteers that have all done at least two trips and between which amazing friendships have been made. These friendships have been the best side-effect of choosing to go to Haiti and people have found it almost as difficult to leave each-other as the country they have grown so attached to. No blog post could ever encompass what this experience has meant to me or the thanks I feel to Misha, Phillip, Lisa, Cinde and all the Random Acts staff for allowing me the opportunity to be part of such meaningful and important projects. Instead I would like to leave you with one small moment from the day. Our tour guide, the absolutely fantastic Cyril, kept such a good eye on us that the moment he saw a volunteer about to eat a stew containing something she was allergic to he immediately intervened and found something she could eat instead. 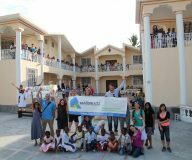 The Hope to Haiti trip is infused with this kind of care and attention to detail, as well as the opportunity to meet people such as Cyril that you would most likely never encounter. But really all you truly need to know to understand what these trips have meant to people is that today, tired and travel weary, nearly all the volunteers expressed their determination to follow Random Acts to their next destination, whenever and wherever that may be.